I finished the ATCs I had planned for those paper towel and baby wipe pieces from yesterday. I like plays on words, puns, and all that sort of thing, and have often used slogans etc for layout titles. These are a substitution joke, if you will. DD, with her SEN issues, is still straddling the line between child and teen. On the one hand she is a boy band fan (I may actually be forced into the cinema today to watch the One Direction movie…ACK! UPDATE: I’m saved! she mis-read the listing and the movie isn’t out til the end of August. Phew!) and on the other she is likely to pull out an old Sesame Street video to watch. She has been watching Get Up And Dance often lately and the song Do the Jelly is stuck in my head. As I was playing with MY Gelli, the idea for these sort of came to me. The backgrounds are the paper towel pulls (For Jiggle and Do the Gelli!) and the baby wipe for the middle one. The glitter mixed with medium technique produced the sparkly dots. One thing about that is there is NO CHANCE the glitter will come unstuck. RESULT! I need to drag out my pasta machine to try a chine colle technique – I think I first saw that in a book by Claundine Hellmuth at some point in the past – for this sort of thing, and maybe even go back to something I’ve done before, printing on paper towels. I just iron them on to freezer paper and put that thru the printer. My thoughts are that it will meld the cut outs to the backgrounds more effectively, making them seem all one piece. I am also thinking it might be totally possible to pull a Gelli print, let it dry 100%, stick THAT to the freezer paper and run it thru the printer. I don’t see why it WOULDN’T work, as I have printed on Gelli prints before. We’ll see. And I wonder why I keep having to replace my printers……DOH! 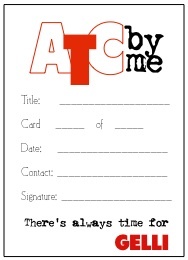 The other thing is a set of ATC backs that I made. I made them for me, of course, and almost didn’t share them as I think they do have limited appeal, but one or two people might find them fun. The old Jell-O slogan There’s Always Room for Jell-O! was the origin, slightly altered to make more sense. I tried to mimic the Gelli packaging, with a typewriter (rather than rubber stamp) font and made the colours work, but the ATC by Me logo is my design from ages back. The sheet is tightly packed, nine backers, in both orientations. They SHOULD print ok on US letter paper, although the top and the bottom border line will be cut off. That shouldn’t matter as they are just the right size for ATC backs and the borders of the paper will still be usable to get the fit right. 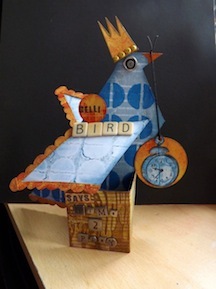 If you use your Gelli prints to make ATCs then you might like to use these for the backs. If you print them on quite heavy card you could even use them as your base – although if you are mucky like me you might want to stick a large Post-It not over the back, or stick them with temporary adhesive to a plain piece of paper to keep them pristine. My ATC backs are SHOCKING usually. So there you go. The experimentation continues. Keep cool…another hot one here, and the only redeeming aspect of sitting in the cinema watching a boy-band movie is the AC. 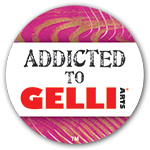 Categories: art, ATCs, downloads, Gelli plate monoprints, printables | Tags: art techniques, ATC, ATCs, Gelli, Gelli plate, printables | Permalink.